Returning to the Second Doctor era with ‘Echoes of Grey,’ John Dorney explores the fascinating concept of Zoe being forced to confront the gap in her photographic memory when a woman claims to have met her alongside the Doctor and Jamie many years ago. As her memories of a visit to the Whitaker Institute in Central Australia return, however, so, too, do the dangerous secrets of a shrouded past and the mysterious Achromatics. The gradual return of Zoe’s memories is effectively conveyed through the use of the present tense and works in harmony with Ali’s use of the past tense. Indeed, Emily Pithon is very effective as this former child prodigy who shares so much in common with Zoe, but the two stories being told don’t quite intertwine enough or deliver any true surprises to make the final revelations as shocking as they are clearly intended to be. A care facility that apparently provides cures for all critical illnesses but that ominously doesn’t see its patients discharged is a suitably mysterious if rather traditional environment, and the discovery of creatures that are able to absorb an individual’s illness and even age is a brilliant notion that plays to the base under siege traditions of this era exceedingly well with the creatures now acting beyond their intended remit, especially as their origins and fates come to light. Unfortunately, while the slower buildup that sees the team casually wander around the facility before tripping an alarm but ultimately gaining everyone’s trust is likewise a staple of this era, it takes up too much of the briefer running time here to allow the full potential of this storyline to fully develop. As a result, the intended shock of Ali using subterfuge with a memory-aiding device to exploit Zoe’s memory about the Achromatics’ healing ability as their individual tales never quite intertwine is instead passed off in a fairly pedestrian manner when exposed, and even the name Achromatics and the Doctor’s pointed questions to Zoe about The Picture of Dorian Gray rather negate any sense of nuance that could have been cultivated. This is not a story that emphasises any sort of ambiguity that a title with grey in it suggests, and the straightforward motivations and actions of everyone involved instead only hint at a far more layered story that these wonderful elements could have come together to create. Despite the lack of immediacy and ultimate intrigue in ‘Echoes of Grey,’ it nonetheless remains an enjoyable listen due to the strength of Wendy Padbury’s narration that has become much more natural and powerful since her first outing in ‘Fear of the Daleks.’ This is unquestionably a story that slots in exceedingly well with the serials of season six, but it simultaneously refuses to do anything completely novel or unexpected in the past or with the unexplored potential of Zoe’s present so long after having her memories of traveling with the Doctor erased. 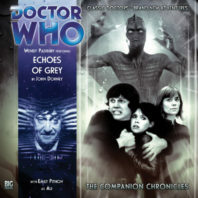 The end result is a strictly average affair that offers glimpses of being something much more profound, and ‘Echoes of Grey’ unfortunately provides another example of the Second Doctor era being the most difficult of the classic eras to successfully adapt for audio with modern and classic expectations both being met.